Tube complement: 12A8G mixer/oscillator, 12K7G IF, 12Q7G detector, 35L6G audio output, 35Z5G rectifier, 100-77 ballast. Approximately 11-3/8 inches / 29 cm wide. I'm puzzled by the bronze metallic painted finish on this set. A Zenith brochure says that this model was available in mahogany, ivory and grey-green finishes. (Thanks to fellow collector Paul Turney, who noticed that Zenith's brochure copy for a couple of other models says "grey and green," not "grey-green." Thus he suggests that Zenith probably meant that this model was available in mahogany, ivory, grey and green colors.) 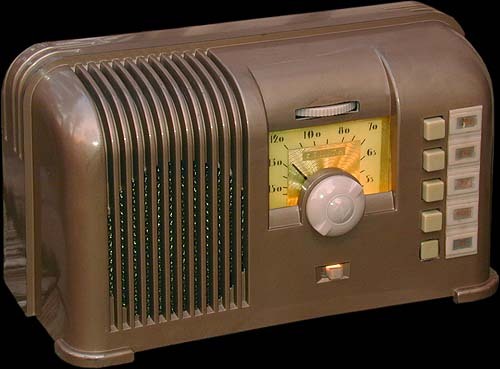 I assume that "mahogany" is unpainted brown Bakelite; and this radio surely isn't ivory or green. But could it be grey? The overspray on the inside of the cabinet (which presumably has not been exposed to light over the years and has changed color little, if at all) is the same color as the outside of this cabinet. And the paint job is definitely very old, and looks factory original. So either someone found a way to call this tan-bronze color grey, or the '414 was also available in this additional color not mentioned in the brochure. Update: Since writing the paragraph above, I've seen two additional copies of this model in this very same color. 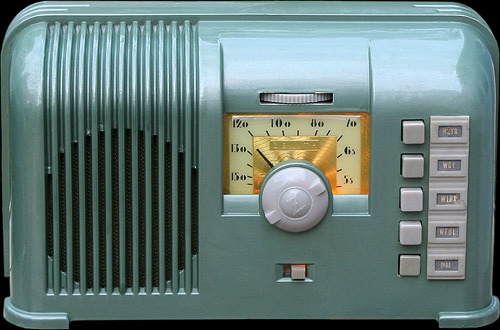 One radio was for sale on the Internet (I lost control and bought it) and the other was for sale at a swapmeet (I was able, this time, to keep my acquisitive urges in check). So there truly can be no doubt that it's a factory-original paint job. The rear view. The one-piece Bakelite cabinet is molded like an upside-down bowl. 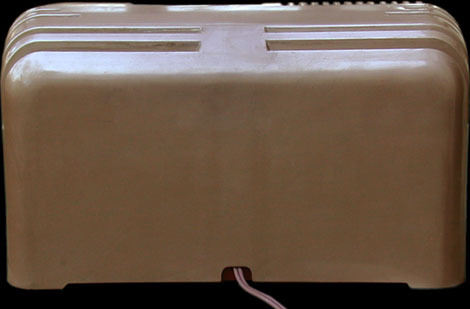 The upside-down Bakelite chassis installs through the bottom. Above, a swell setup from the 1940 Zenith brochure. 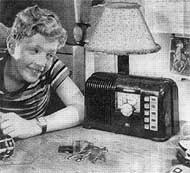 In 1940, I would think only boys from privileged families would have their own radio and wristwatch. 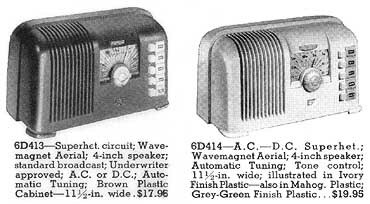 From the same 1940 Zenith brochure. As in the case of the 6D410 & 6D411, the 6D413 & 6D414 are identical except that the '413 lacks the two-position tone switch and comes in unpainted brown Bakelite only. As in the case of the 6D410 & 6D411 again, the 6D414's brown Bakelite gets the embellished appellation "Mahogany." This is a 6D414 with the green finish. Here are two views of the green 6D414's upside-down Bakelite chassis. 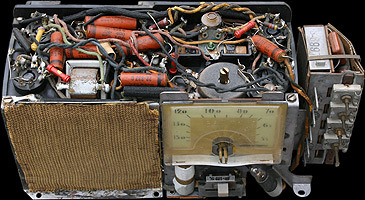 Above left is the front view, which displays the chassis in its normal orientation (tubes hanging down from sockets, circuit components on top). The view above right shows the chassis flipped over so that the tubes are visible. 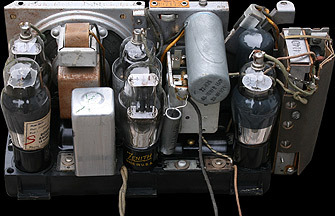 This original Zenith-branded 35L6G tube was apparently suspected and tested in February 1944. It was good then and it's still good now.